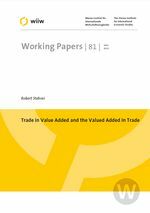 This paper discussed two measures of value added flows between countries: ‘Trade in value added’ accounts for value added of one country directly and indirectly embodied in final consumption of another country. ‘Value added in trade’ measures the value added embodied in gross trade flows. The paper shows that both measures result in the same overall net trade of a country which equals its trade balance in gross terms which however does not hold for bilateral relations. These value added flows can further be broken down by various production factors including capital and labour income by educational attainment categories. Using the recently compiled World Input-Output Database (WIOD) selected results comparing the EU-27, the USA, Japan and China based on both concepts regarding value added flows across countries are presented. For example, the US trade deficit with China is reduced by about 25% but would increase with respect to the EU-27 by about 20%. These imbalances are further broken down by factor incomes.